Do you want to build an email list but aren’t sure which email marketing service to choose? Constant Contact has been an industry leader in email marketing for over 20 years. In our Constant Contact review, we’ve put their promises to the test so you can decide if it’s the best email marketing service for your needs. If you have a website that has traffic, then you need to do email marketing. Email marketing helps you connect with your audience and build a long-lasting relationship with them. Most small businesses find email marketing to be an essential tool for increasing sales and revenue. Increase repeat visits: With email marketing, you can connect with your audience by collecting their email addresses and send them valuable content. You can also encourage them to return to your website often. Increase conversions: Email conversions outperform both social and organic search traffic. If you want to generate more sales, then you’ll need to start email marketing. Generate more revenue: Studies show that email marketing helps you get a $38 average for every $1 spent. Constant Contact makes it easy for you to build an email list even if you’re an absolute beginner. Upon signing up, you’ll be asked to choose an industry. Based on your selection, you’ll get industry-specific suggestions for email campaigns to grow your business. You’ll also receive email template design tips, which help you create and send emails that get opened, read, and clicked. Let’s take a deeper look into the features of Constant Contact and why it’s the best email marketing service for beginners. The powerful drag and drop editor makes it easy for you to create beautiful, engaging emails. You can find loads of built-in, mobile-optimized, templates that look great on all devices. That way, you don’t always have to build your email newsletters from scratch. To save time, you can choose the right template for your emails and then customize it the way you want. Constant Contact comes with real-time reporting and analytics that give you insights into how your email marketing campaigns are performing. 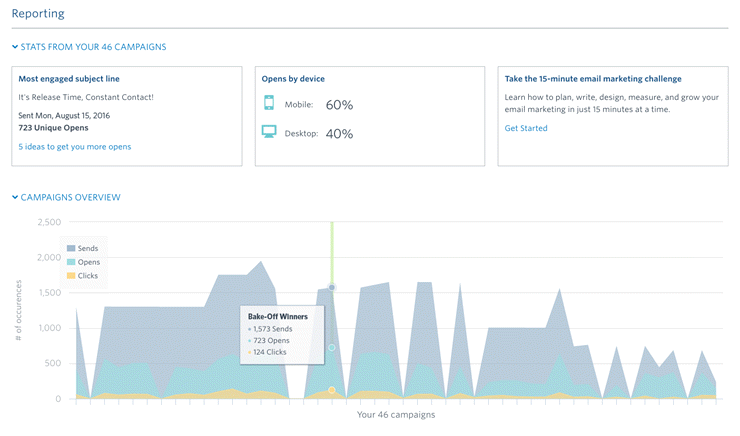 The engagement report allows you to track the performance of your email campaigns by showing you important metrics, including sends, opens, clicks, and more. You can even compare the performance of different email campaigns to see which one got the most opens and clicks. You’ll also get click-tracking heatmaps, which show you optimal button placement for driving more clicks. Connecting your Constant Contact account with your WordPress website is super simple. Although you can easily embed a signup form to collect emails, we highly recommend you embed your form through a contact form WordPress plugin instead. Easy embedding: With a plugin, you don’t have to mess with the embed code. Once you connect Constant Contact with your contact form plugin, you can easily add a signup form directly from your WordPress dashboard. No login required: You don’t always have to log into your Constant Contact account every time you want to create a signup form because you can do it from your WordPress admin. Grow your email list using any contact form: To grow your email list, you don’t always have to build a separate signup form. You can include a checkbox on any contact form on your website. If the box is checked, you can add the contacts to your email list. You can find a lot of different contact form plugins in the WordPress repository that provide Constant Contact integration. However, we recommend WPForms because it offers Constant Contact integration out of the box. WPForms is the best contact form plugin for WordPress. With WPForms, you can integrate Constant Contact immediately without having to install any addons. Read the complete WPForms review for more information. How Does Constant Contact Stack Up Against the Competition? Constant Contact is best suited for smart businesses who’re just starting out with email marketing. Let’s take a look at a few areas where Constant Contact excels in comparison to other email marketing services. While most email marketing services offer 14 or 30-day free trial to test their service, Constant Contact gives you full access to their tools for 60 days. After the trial, the subscription starts at $20 per month for up to 500 subscribers. Constant Contact comes with a beautiful interface, which makes it easy for anyone to get started with email marketing. The powerful drag and drop editor makes it effortless to create and tweak your emails into what your subscribers will love. With every plan, you get access to beautiful pre-built mobile optimized templates that look great on every device. Create a custom web page to receive online donations. Create simple online surveys and polls. Manage your events with custom invitations, online registrations, payment collections, etc. Our Constant Contact review wouldn’t be complete without revealing the downsides of the software. Limited automation tools: As an email marketing service, Constant Contact is built for beginner-level users, so it lacks many behavior targeting capabilities that advanced users will need. Price: Compared to other email marketing services like SendinBlue, MailChimp, and Constant Contact alternatives, Constant Contact is a bit expensive. However, if you need a beginner-friendly email marketing service, then Constant Contact is the best choice. Constant Contact gives you a 60-day free trial to test their service. During the free trial, you can explore all the campaign types and features that it has to offer. The pricing starts at $20 per month based on the number of active contacts in your account. The Email plan is the best choice for users who want to send and schedule email newsletters. You’ll get all the basic features, including contact management, email scheduling, list building tools, and so on. If you need an autoresponder to send emails to the right people at the right time, like for birthdays and anniversaries, then Email Plus is the best choice for you. You’ll also get advanced features like Surveys and Polls, Coupons, A/B testing, etc. 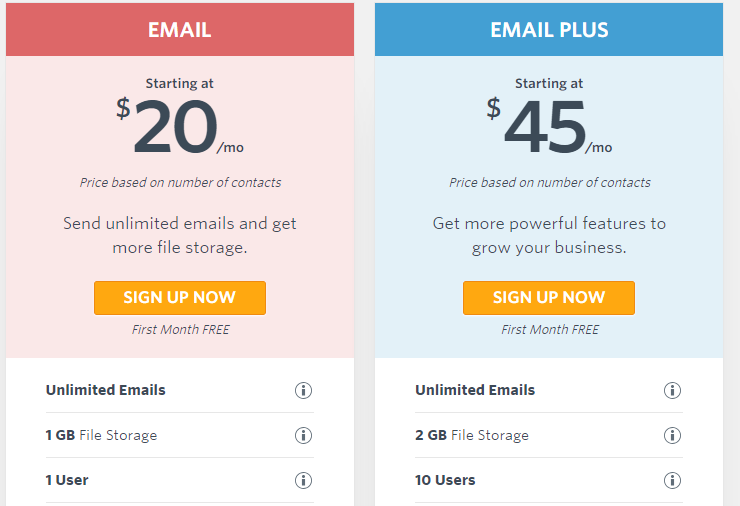 The Email Plus plan costs $45 per month. Constant Contact provides unmatched support with live chat, emails, and discussion forums. They also have a vast library of resources that help you walk you through every aspect of email marketing with Constant Contact. 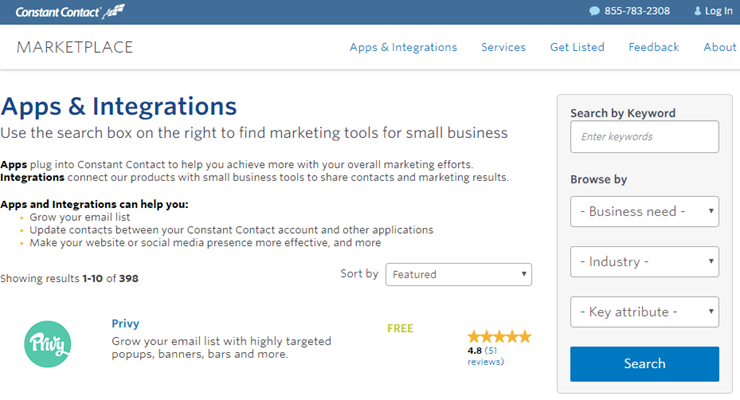 Constant Contact is the perfect choice for beginner-level email marketers, small businesses, and non-profits who need an easy-to-use tool for building an email list. From the powerful drag and drop editor to ready-made templates to beautifully organized contact management to powerful reporting, you’ll find all the features you need to succeed in your email marketing. You can begin with the Email plan when you’re starting out, especially if you don’t need autoresponder. As you grow, you can upgrade to Email Plus for more advanced email automation features.